Women on a Mission: Mom Edition: TEA LESSON PART FOUR: KEURIG TEA! First up, a shout-out to Karla, who happens to be a WOM-MOM follower, great friend, and one of Mur-Man’s Godmothers. Karla knows I LOVE ICED TEA—Karla, along with Ethne and Melisa, served ice tea at my baby shower! I LOVE A GOOD GLASS WITH NO SUGAR! I LIKE IT ICE COLD AND BREWED! Karla's all decked out on the left! 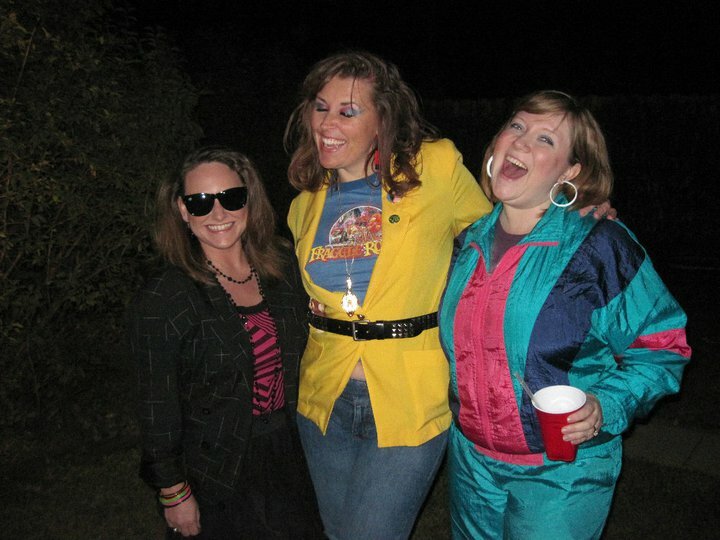 WE HEART THE 80'S! I received a Keurig for mother’s day ( I would recommend a Keurig to anyone—it is fabulous!). As of yesterday, I had ONLY brewed coffee in my Keurig. However, Karla recently gave me a pod that was half iced tea/half lemonade and meant to brew over ice! I was SUPER excited to try it! And…I was NOT disappointed. Karla said this was purchased at Wal-Mart. I am so going to get some! It’s super simple. Load pod, put ice in glass, hit go! DONE! Make sure your glass is large enough to hold the ice and the tea (I made this mistake the first time and will upgrade to a larger cup in the future). TOO FULL! Larger glass needed next time! I don't want ANY tea to go to waste! Sun tea is great (like Ethne showed you), but this takes no time too. PLUS--you will have ice tea immediately! This takes seconds. And I know a good cup of iced tea—and THIS WAS GOOD! WOMS—TRY IT! Steve has no choice...he has to LOVE tea! PS: If you don’t have a Keurig, brew a cup of tea in the microwave and then dump over a glass of ice. Same principle, but a few more steps. I did this pre-Keurig and it worked too. We are looking to get one of these...showing this post to Josh! Roxanne: GET ONE! YOU WILL LOVE IT!